Since 2012, UniPlace has operated a community dinner program that feeds over 100 people each week. This meal program, which is operated by students from the University of Illinois, seeks to address not only the issues of hunger insecurity in Champaign, Illinois. But the meal program is completely run by university students who prepare and serve the meals. In September 2017, UniPlace started a field study program allowing students in certain majors to study the effects of hunger and housing insecurities in our community while also working to connect our dinner guests to different community resources. These students from the University of Illinois also interact with our community dinner guests who often find themselves struggling with hunger and housing insecurities. And starting in September 2018, students from local high schools will have the opportunity to work in our kitchen gaining culinary and workplace skills to prepare them for opportunities after graduation. UniPlace has served over 10,000 meals to those in the Champaign-Urbana Community since it began. 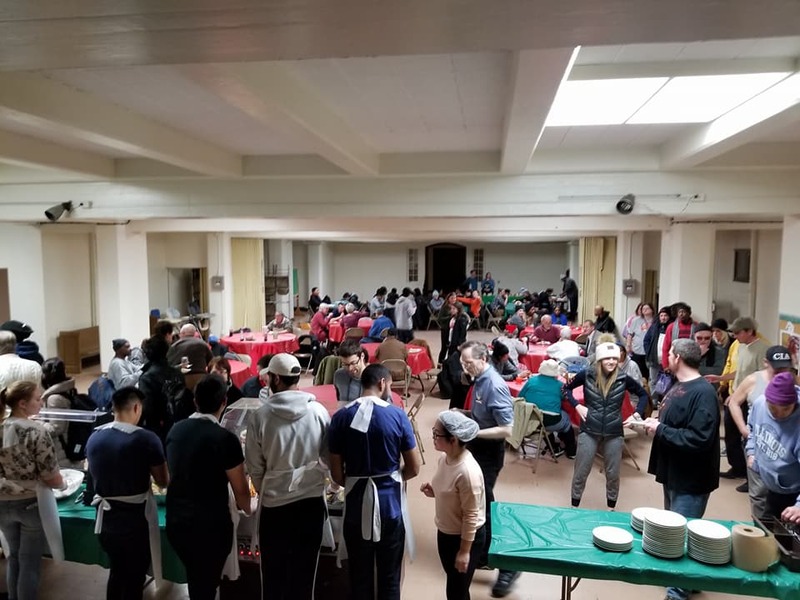 Each community dinner has approximately 100 participants. About 400 students from the University of Illinois volunteer at the UniPlace Community Dinner each year. University of Illinois Community Dinner Partners includes; Alpha Phi Omega (APO), Volunteer Illini Project (VIP), and many other student groups. Have a business or community organization and like to be a financial sponsor? If so, click here for more information. Want To Volunteer At A Dinner? To all those who volunteer at the UniPlace Community Dinner and our many University of Illinois student groups, financial sponsors, and education programs, thank you for helping UniPlace feed over 100 people each week!